Flowers bouquet: 12 red roses, 6 pink carnation, pai grass modest. Pale yellow plastic transparent paper packaging, pink ribbon beam width take. 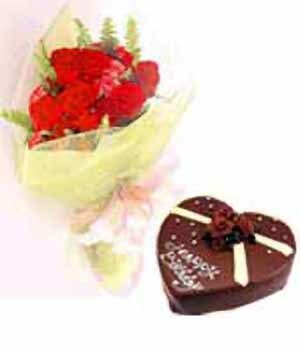 Cake: chocolate cake, heart-shaped, with the top four butterfly rose was nodose decoration, a white "Happy Birthday" words. Roses are always fabulously Fresh and beautiful.. Straightforward communication; I like it. Excellent.